There are 4 types of Coconut Oil and let’s look at each one of these types in detail. Natural saturated fats like coconut oil are becoming a much sought after commodity due to the various health benefits they offer. Coconut oil, often called ‘miracle oil’, not only aids weight loss and boosts metabolism but also hydrates the skin and improves digestion. This is because coconut oil contains lauric acid and capric acid that have a number of anti-fungal, anti-bacterial, and soothing qualities. 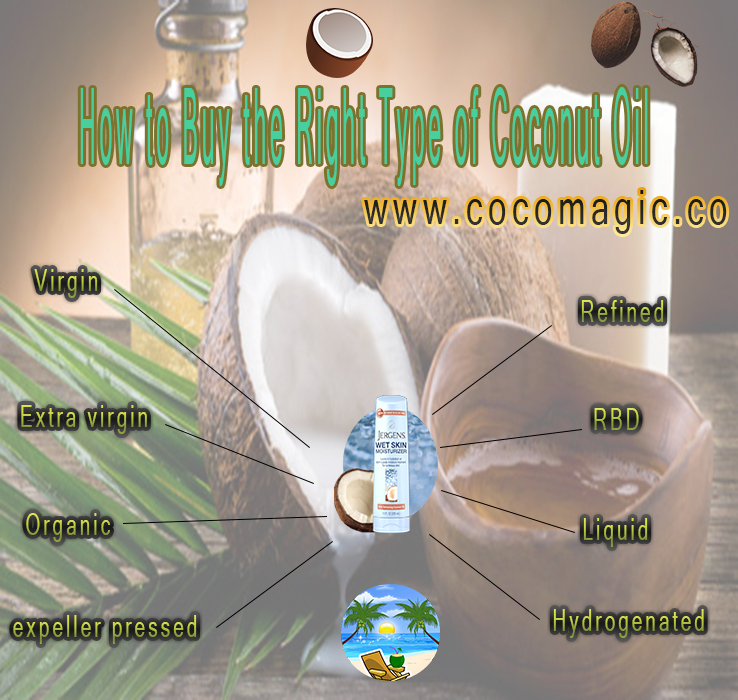 However, there are several types of coconut oil available in the market nowadays and it is important to understand the difference between the many varieties to choose the one most suitable for you. Let us look at the different types of coconut oil available to help you make an informed decision. Pure or refined coconut oil is obtained by refining, bleaching and deodorizing the crude coconut oil that is obtained from the dried coconut meat or copra. The oil is refined because the dry copra is not fit for consumption and the impurities need to be removed. 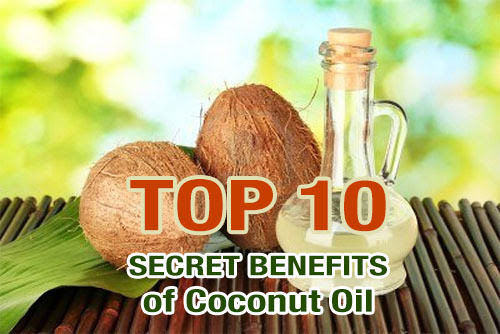 This process does not affect the fatty acids of coconut oil but reduces some of its nutrients. Most of the coconut oil available in the market nowadays is refined coconut oil unless specified otherwise on the label. Since, all the impurities have been removed this oil, has a higher smoke point than unrefined oil and can be used for deep-frying.Refined oil can also be used as a moisturizer or in soaps. It is also cheaper and fairly tasteless and odorless. At times this refined coconut oil is hydrogenated, which creates synthetic trans fats that should be avoided at all costs. The oil is hydrogenated or partially hydrogenated so that it can remain solid at high temperatures to put in candies or baked goods. Sometimes the coconut oil from the copra is refined using physical extraction methods, which is considered more pure as they do not contain any chemical solvents. Unrefined coconut oil is termed as ‘virgin’ or ‘extra virgin’ as it is extracted from the fresh coconut and not the copra. This kind of oil has not been exposed to any kind of chemical solvent or bleached. There are two ways of extracting the oil from the fresh coconut: wet milling or quick drying. Wet milling: In the wet milling process, the coconut oil is extracted from the wet coconut meat and then later separated from the water. To separate the oil from the water, several methods are used including boiling, fermentation and refrigeration. 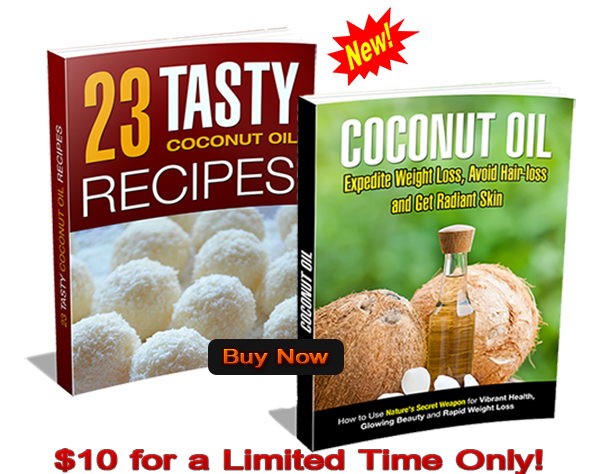 This method is considered to produce coconut oil that has the highest density of nutrients. Quick drying: In this process, the coconut oil is extracted after first drying the coconut by first drying it. This is mainly used when oil needs to be produced in bulk. Unrefined or virgin coconut oil contains phytonutrients or polyphenols that have anti-oxidant and anti-biotic flavors and helps prevents cancer.Unrefined coconut oil is known to have a coconut taste and smell but the intensity depends on the amount of heat to which it has been exposed. Liquid coconut oil is made by removing some of the medium-chain fatty acids of coconut oil, including lauric acid. Lauric acid is coconut oil’s most beneficial and dominant fatty acid. It is best to avoid using this brand of coconut oil. Organic coconut oil is extracted from coconuts that have been grown using organic manure and do not involve the use of fertilizers or insecticides. However, this variety is quite pricey and is scantily available. A tablespoon of coconut oil contains no proteins and carbohydrates but contains 117 calories and 13.6 grams of fat. Coconut oil also contains iron and is rich in phenolic compounds. These phenolic compounds are rich in anti-oxidants. Unrefined oil has the highest quantity of phenolic compounds and is thus a major source of anti-oxidants. Now, once you know the different types of coconut oil and their benefits, you need to make sure you choose the right brand. While choosing a brand, do a bit of research and find out what method of extraction the brand uses. Most coconut oil labels will have information about their history, process and methods of extraction. It is always beneficial to go for the more reputed and trusted brands. You should also note the manufacturing date of the coconut oil. Color:It is also important to note the difference in color of the oil. It should be white when solid and colorless in liquid form. If there is any discoloration, it means that the oil has been contaminated and is of low-grade quality. Smell:Another factor that is important to note is the smell. Virgin oil does not have a strong overpowering coconut smell so if the oil smells roasted, it means it has been exposed to a lot of heat. Thus, it will not contain all the nutrients. 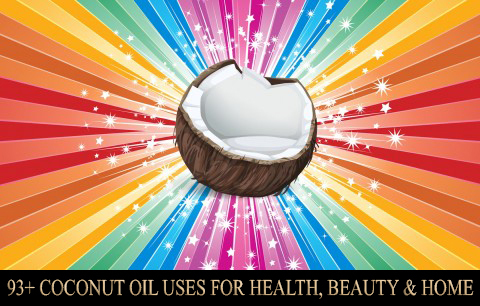 Refined or treated oil will be odorless and will not have a strong coconut taste. Price: It is also important to check the prices of the various brands of coconut oils. Just because a particular brand is more expensive, does not necessarily mean it is of superior quality. Since coconut oil lasts for about 12 months, it is always advisable to buy it in bulk. Purpose: The main thing to note when buying coconut oil is, your purpose for buying it as well as where it is going to be used. Refined coconut oil is best for cooking and therapeutic purposes while virgin coconut oil is beneficial for weight loss and medicinal uses. Storage: After you have purchased your choice of coconut oil, it is important to store it in the right manner. In places with colder climate, coconut oil is generally stored in broad containers. If you have purchased coconut oil that has been packaged in a tetra pack, it is always advisable to keep the oil in a tight container after usage.